Order of the Eastern Star and Order of Amaranth: What is their relationship? The Order of Amaranth and Order of the Eastern Star have an intertwined history. Early twentieth-century minute books of Order of Amaranth, donated by Barbara Lott in 2007, illuminate this relationship. The postcard (MM 015) on the left depicts the symbol for the Order of Eastern Star, a symbol that is used in ritual as a teaching tool. The five-pointed star represents Biblical characters. Adah is the first point and is representative of Jephthah's daughter. Adah's point is blue. Ruth, who was a widow and gleaned the fields of Boaz is the secont point. Ruth's point is yellow. Esther, the wife, is the third point and was Ahasuerus' queen. Her color is white. Martha, the sister is the fourth point and represents the sister of Lazarus. Her color is dark green. Electa, the mother, is the fifth point on the star. Though Electa does not appear in the Bible, her story is based on the Book of St. John. Her color is red. Each point to the star has emblems associated with it, which relate to the Biblical stories. The Order of Amaranth was first organized in 1873 in New York, New York. It was intended to be a higher degree in the Order of the Eastern Star. Amaranth was to be a third degree, and Eastern Star and Queen of the South were to be the first and second degrees. 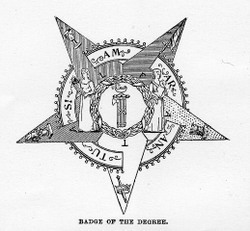 However, Order of the Eastern Star rejected this plan (conceived by James B. Taylor), and the Order of Amaranth became an independent order in 1895 in Brooklyn, New York. At first, Amaranth members had to be members of Eastern Star. In 1904, in chartering Jessemine Court, No. 6 of New London, Connecticut, the minute book reads, "The undersigned, either the wives, widows, mothers, sisters, or daughters of Master Masons or affiliation with Master Masons in good standing and in possession of the degree of the Eastern Star..." This requirement that Amaranth members first be Eastern Star members continued from 1873 until 1921. In 1921, by mutual agreement, the requirement that Amaranth members belong to the Eastern Star ceased. They are now completely separate organizations. Early evidence of this can be found in the minutes of 1931, in chartering the Charity Court No. 17 of Windsor Locks, Connecticut, in which the Grand Royal Patron, Fred C. Tilden, remarked that "the Order of the Amaranth was no part of the Eastern Star though working in Harmony with that Order." The illustration of the star seen here is the frontispiece from Robert Macoy's The Amaranth (Independent): A Royal and Exalted Degree in the Rite of Adoption with Appropriate Ceremonies [Call number: 81 .A488 M171 1897]. 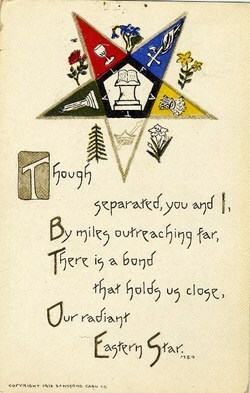 The illustration depicts the badge for Order of Amaranth members. The symbol is similar to the OES symbol seen above, but has an Amaranthine wreath at the center of the star. A wreath made of amaranth was used to crown a new candidate when the Amaranth degree was conferred on a new candidate. The amaranth was chosen for its symbolic nature - the Greek root of the word means "never-fading." Macoy, Robert. The Amaranth (Independent): A Royal and Exalted Degree in the Rite of Adoption with Appropriate Ceremonies. New York: Macoy Publishing & Masonic Supply Co., 1897.